Times of the Islands – Tracking Those Teens! Following sea turtle migration via satellite. They have it down to an art. One stands on the bow of the boat, the other is poised to kick the boat into gear. Both are scanning the crystal clear water for dark shadows that show any sign of movement. Someone shouts that they’ve spotted one and the boat takes off, closely following the shadow through the water, mimicking every twist or turn that it makes. They are catching sea turtles. 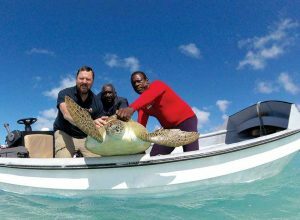 Sea turtles are still a highly valued food source in the Turks & Caicos Islands, primarily as part of a rich cultural history, and Gilbert Jennings and Dave Clare are the best sea turtle fishermen around. The Turks & Caicos Islands Turtle Project is contributing to a better understanding of sea turtle populations in the TCI. Dave and Gilbert now lend their expert skills to a long-running conservation project. The Turks & Caicos Islands Turtle Project (TCITP), initiated in 2008 by the Marine Conservation Society and the University of Exeter (UK), has contributed to a deeper understanding of sea turtle populations in the TCI, how they use the marine environment, and how they are impacted by traditional fishing practices. The TCITP conducts an extensive mark-recapture project with multiple partners throughout the Islands, including the Department of Environment & Coastal Resources (DECR), Amanyara Resort, SURFside Ocean Academy and the School for Field Studies (SFS). Sea turtles are captured, measured and tagged with metal flipper tags. These tags can provide incredible insight into the lives of sea turtles. They have allowed the project to confirm site fidelity of turtles, where individual turtles are recaptured in the same area over the course of multiple years. They also provide information on migrations, where sea turtles tagged in the TCI have been identified as far away as Nicaragua. In December 2017, the team was thrilled to learn that a hawksbill turtle flipper-tagged in South Caicos as a juvenile in 2009 had emerged as an adult female to nest on a remote beach in Puerto Rico. In recent years, a team has come together annually with Dave and Gilbert led by Dr. Peter Richardson from the MCS along with Jackie Walker from the Amanyara Turtle Initiative, and Katharine Hart from the DECR. This part of the project takes a more in-depth look at the elusive lifecycle of the sea turtles found in TCI waters. It aims to catch large teenage green sea turtles and fit each one with a satellite transmitter (satellite tag). So far, 17 teenage green turtles have been satellite tagged and tracked by the project, including four in February 2018. These four satellite tags were sponsored by Amanyara guests Kim Charlton and Stephen Meringoff, MCS supporters Mr. and Mrs. Flockhart and the Gerrity family, Princess Yachts and the Amanyara Turtle Initiative. The satellite tags are glued to the turtles’ shells using marine epoxy. Each time the turtle comes to the surface to breathe, the tag transmits a signal to a satellite, which provides the precise location for the turtle and allows the researchers to follow their movements on a daily basis. Our tracking research is trying to better understand two key mysteries: How do teenage turtles use TCI waters? Where do they go when they leave TCI? Young sea turtles, about dinner-plate size, settle in shallow TCI waters after drifting for several years on ocean currents. We think they remain here for years to grow into teenagers, making TCI a regionally important developmental ground for these juvenile and sub-adult turtles. 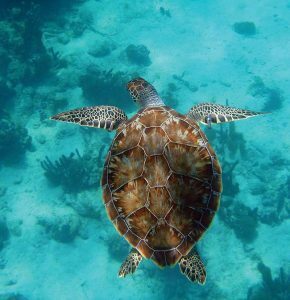 Teenage turtles are protected under TCI law, and to understand how best to further the conservation of these turtles, it is useful for us to know which areas in TCI waters are particularly important for them. But then where do they go? The theory goes that once they grow large and near maturity, they migrate away from these developmental grounds and settle in their adult feeding areas which could be thousands of miles away, but closer to the beach where they first hatched, and where they will likely return to breed as mature adults. This theory is yet to be proved, so through our satellite tracking study we hope to be the first to find out whether or not the theory is correct. Peter Richardson, Gilbert Jennings and Dave Clare release a tagged sea turtle (named Scooter by TCI schoolchildren) back into the sea. Where will it go next? So far, TCI teenage green turtles have been tracked migrating to a number of different countries including Cuba, the USA, Costa Rica and Colombia. The TCITP is excited to watch the four newly tagged turtles to see if and when they migrate, and where they might end up. These long-ranging sea turtles highlight the importance of communication and collaboration between countries and regions. During their migrations, they are subject to multiple and varied regulations as they cross country boundaries. How we conserve sea turtle populations in the TCI undoubtedly impacts their ability to thrive in those countries they migrate through, to and from. School groups from Providenciales were invited to visit the turtles while they were being fitted with their satellite transmitters, getting an up-close look at these incredible, charismatic voyagers and the opportunity to talk directly to the sea turtle researchers. You, too, can join us in following Scooter, Chief, Lumi II and Wayne II at www.mcsuk.org.